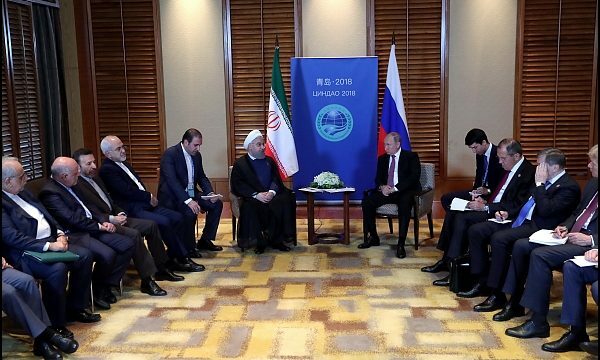 IRNA – Iranian President Hassan Rouhani held talks here on Saturday with his Russian counterpart Vladimir Putin on issues of mutual interests. President Rouhani is in China for the Shanghai Cooperation Organization (SCO) summit in Qingdao in east coast of China from June 9-10. In the meeting, the Iranian president and his Russian counterpart also talked about ways to widen Tehran-Moscow political and economic relations. The two presidents also discussed regional issues including the latest situation of the July 2015 nuclear deal from which the US withdrew unilaterally on May 8. Prior to his meeting with Putin, Rouhani held talks with the Pakistani President Mamnoon Hussain. Later, President Rouhani is to host his Mongolian counterpart Khaltmaagiin Battulga at his official residence here.